After the supposed “near-catastrophe” that was just a minor navigation problem, a new crew of three astronauts has now finally arrived on the International Space Station. They had to take the long way with 34 instead of 4 orbits, but no one was stuck in space like some of the more sensational news headlines claimed. 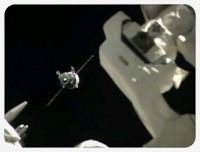 The docking was actually quite amazing to watch on NASA TV, with the spaceship slowy coming nearer and the final docking even a little ahead of schedule. Videos with the highlights of the docking and the hatch opening and the welcome ceremonies are already up on Youtube. But who’s now up there and who has just arrived? I originally wanted to keep tabs on the astronauts regularly since I had written a first article in November, but was so busy to write a followup, so I’ll just start again. Who’s up: Already on the station since November 2013 are Rick Mastracchio from the USA, Koichi Wakata from Japan and Mikhail Tyurin from Russia. Both Mastracchio and Wakata have been busy tweeting a lot of great photos from space as @AstroRM and @Astro_Wakata – Rick’s recent photo of the Soyuz launch actually made a lot of well-deserved news headlines since! All three are staying about two more months and will be going home in late May. Who’s arriving: The second half of Expedition 39 are Aleksandr Skvortsov and Oleg Artemyev from Russia and Steven R. Swanson from the US, who will be staying until September and have just arrived with the delayed Soyuz flight. Swanson and Skvortsov are on their third and second spaceflight, but Artemyev is a rookie astronaut on his first venture into space. Sadly, the russians are not using any social media (yet?) and Swanson does not seem to be using Twitter either, so when the first half of Expedition 39 goes home and the three become the first half of Expedition 40 waiting for the new arrivals, there could be a short social media outage from the ISS. But NASA has opened up an Instagram account which will supposedly be used by Steven Swanson. Who’s coming: It won’t be long until the next personnel change on the ISS when the first half of Expedition 39 is leaving in late May and the next three astronauts go up: Reid Wiseman from the US, Maksim Surayev from Russia and Alexander Gerst from Germany! I expect our media will go nuts over this, but maybe it will bring spaceflight a bit more into the public here again. It’s actually Wiseman’s and Gerst’s first flight and they both have already been extensively reporting about their experiences as @Astro_Reid and @Astro_Alex on Twitter in a very casual and friendly way, so their stay on the ISS will certainly be interesting. Also notable is the italian ESA astronaut Samantha Cristoforetti, who will be going to the ISS in November and is chronicling her preparations in a detailed logbook on Google+ and is also active on Twitter as @AstroSamantha. Save for Chris Hadfield (who is actually a retired Astronaut now), I only know one other astronaut who is active on Google+: Andreas Mogensen from Denmark, who will be launching in November 2015 to the ISS, but only on a short 10-day-mission. Last November, I had already made my Twitter Astronaut List public and I’ve been updating it ever since, so if you want to have a good overview of just about everyone who is, was and is going to be in space, this might come in handy. As usual, you can also watch NASA TV live and recordings and excerpts are always on the NASA TV Youtube Channel and ReelNASA. That’s it for this article – the next one will be coming sometime in late May when the next astronaut changeover is happening! Last year I wrote about the new, faster and more comfortable launch approach the Soyuz spaceships have been taking since the end of 2012 to reach the International Space Station, which just takes six hours instead of almost two days as before. Last night, in a picture-perfect night launch, three astronauts, Aleksandr Skvortsov and Oleg Artemyev from Roscosmos and Steven R. Swanson from NASA went up from Baikonur and originally were again scheduled to arrive only six hours later, but this time there was a slight navigation problem which prompted the onboard computer to break off the final approach. Instead, the Soyuz will now take the old 34-orbit journey, which unfortunately takes about two days, but is actually just a completely normal procedure. The media is, of course, really freaking out about this, especially here in Germany because the German ESA astronaut Alexander Gerst is going up with the next flight in May. Headlines like “Serious computer glitch prevents astronauts from reaching ISS” or “Space docking maneuver failed” are making the rounds, but as usual Spiegel Online has the best fearmongering going with “Flight to the ISS: Russians and Americans stuck in space”. No, the docking didn’t fail and the final approach also didn’t fail because the flight computer didn’t even attempt to do it. What apparently went wrong was that the last burn before the final one resulted in a slightly wrong orbit, which is not surprising because the faster approach requires much more precision than the standard, long flight. The crew is okay, they have enough provisions to last even longer than the two days it takes them to reach now and while this is certainly uncomfortable, it was actually completely normal until the end of 2012. And the engine is working and nobody is “stuck” – they’re actually flying right now and performing regular burns to sneak up on the ISS in the old-fashioned way. I shouldn’t even complain about this, because it’s always the same each time something out of the ordinary happens during these launches – if everything goes according to plan, the media basically just ignores it, but if there’s only the slightest problem everybody jumps on it like a bloodhound. What I especially dislike about the current reporting is that many journalists want to make this all about politics because of the Ukraine and Crimea tensions. Do the Russian astronauts even talk with the Americans anymore? 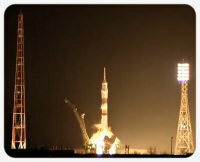 Are the Americans stranded on the ISS because Russia won’t let them use their Soyuz capsules anymore? These are only some of the outrageous questions that are asked and often very inaccurately answered. What many people don’t realize is that the daily operations of the space station and the flights up to it are largely independent of any short-term political decisions – even Roscosmos is not as close to the Kremlin as you might think. There are scientists and engineers at work, not politicians and long-term contracts like NASA has with Roscosmos to buy seats on the Soyuz cannot be cancelled just like that. The bottom line is, in the words of Douglas Adams, Don’t Panic. A minor problem with the flight computer means that the astronauts will arrive a little later on the station. If not and something more serious happens, I stand corrected – but the chance of this happening are astronomically small. Because this article has turned out to be longer than originally intended, I’ll write another one with a little breakdown who is actually up on the space station, who will be coming and who will be going for tomorrow when the Astronauts actually arrive. A recent post of a fellow photographer over on Google+ got me thinking about the dynamic of circles and plusses. If a couple of thousand people have you in their circles, you should get an equal amount of plusses, right? It turns out that it doesn’t really work that way and the amount of users who have you circled often stands in absolutely no relation to the amount of plusses you get. • Post a series about 30-year-old computers: land on the What’s Hot list for the first few articles and get more than 400 plusses, but then further articles get almost nothing. 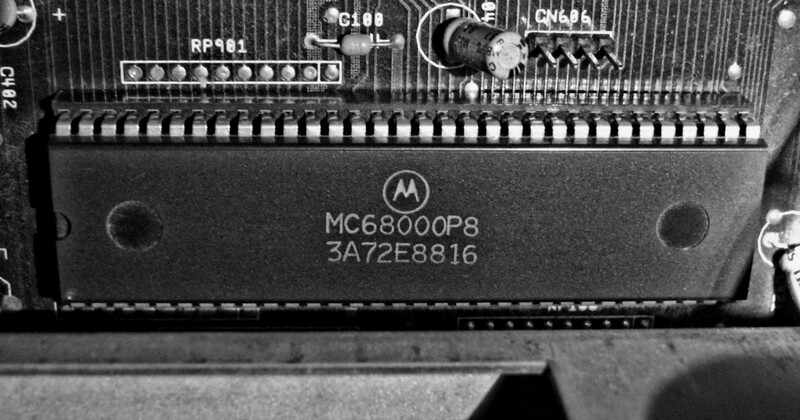 • Post a photo of a 30-year-old computer mainboard: get more than 50 plusses. • Post your usual photos: get between 10-20 plusses, sometimes a bit more. • Post a link to a movie review you’ve worked on for a couple of evenings: one or two plusses maximum. The last two are actually not surprising, since most of the users who have circled me care about photography, but less about science and movies. I just haven’t found the right crowd yet for this, but there are already some signs of improvement lately. Somewhat puzzling is also the difference between the amount of image views and the plusses – for example, a recent picture of two daffodil blossoms just got 19 plusses, but over 3000 views. 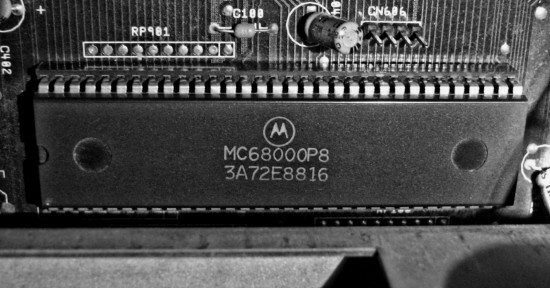 One of the photos of a C64 I’ve used to illustrate a Vintage Computing article almost has 200000 views, but then the post itself also got over 400 pluses. Mostly my photos seem to get between 100 and 300 views, but a couple go into the thousands and don’t have more plusses than the others. One problem is that nobody seems to know how the image views are counted – does a view mean a user really clicked on an image and viewed it large or just that it appeared in his stream? The best method to get noticed on Google+ is, of course, to actually talk to people by having conversations in the comments – if you get to know someone better, you’re also bound to give them a plus or two occasionally. While I give out plusses quite liberally for a group of selected people just because I like what they post on Google+, I do not automatically expect them to do the same with my posts. It’s not a “I plus you and you plus me” game, but when someone gives me a plus, I almost always take a look at their profile and may also give them some plusses if I like their work. 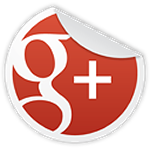 Google+ is all about discovering other people and this is often only the first step. Of course there’s a lot more, but I won’t even go into the use of hashtags and all the photography themes, because then this article would never end! Again, I’m not complaining, just observing and noticing, because despite the sometimes erratic feedback, Google+ is a lot of fun and I’ve learned to know many fascinating people from all over the world whom I would never have met otherwise! I haven’t done a Music Monday in ages and I think it’s time to share some music once in a while again. And today I need something really funny. There’s only one musician who can fit knickers and economy into one song: the great Neil Innes, also sometimes known as the seventh Monty Python because he often worked with them. He’s an amazing satirical songwriter who has parodied just about anything – this one originally came about as a project for the Rutles (which are a whole other story! ), but later he recorded it as a part of his television series The Innes Book of Records, where he did amazing music videos for many of his songs. I post this every year, but this time I’ll write it in English for a change: I don’t want to spoil anyone’s fun, but please leave me alone with the German carnival – I just don’t like it and I don’t want to be any part of it. 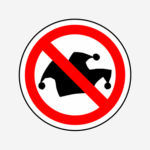 My websites are, and always will be a Carnival Free Zone – Karnevalfreie Zone! Two years ago, I already had uploaded my selfmade “traffic sign” as a SVG vector graphics file for free use and this year I’ve also added a PDF version. If anyone wants to print it out and hang it somewhere as a warning, please feel free to do so. Once again – party if you want to, but please don’t expect me to join in. It’s just not my thing, but some people around here don’t seem to understand that and with the media bombarding everyone with endless carneval for weeks, it can be somewhat overbearing.